Bless you for your patience and organization. Yet I believe you “silly mommy” quote is felt by one and all of us parents. It seems no matter how prepared, how well behaved our children “normally” are, we have all experienced similar situations. PS: Have you enrolled her in any martial arts classes yet? She looks so innocent in the picture 😉 I bet she tricks you into taking her somewhere again within the next 6 months. You don’t seem like the sort of person who is going to stay in one place. I hope it goes better next time. You sound like someone that needs a hug. And perhaps a small vacation from your daughter. In lew of that, let me tell you that I have a delightful niece named Kate. Blessedly enough Kate grew up and those lungs now sing the sweetest notes her parents could ever hear. (she has a beautiful voice & has scholarship in choir) She is still a daddy’s girl & now & then gives her mom lip, but all in all (b/c I’m the aunt) she’s a doll. A beautiful, well balanced good kid. Just remember hw much you are going to miss her when you fly to Denver ALL BY YOURSELF! Oh wow! You poor thing! You need a Vacation! I kid! Sounds like hell. Hopefully the next time will be better. Box. Excellent idea! We actually made it home yesterday and she was an ANGEL the whole damn way. She even told the TSA agent “I’m going to be a good girl and NO CRYING” as we went trough security. Go figure. In my town this summer a guy stole a car that a woman left running while she ran in the store. Apparently the 3-year-old’s screaming in the back street made the dude pull over a block away and run. They found the car very quickly and thankfully she was physically fine. It’s a powerful weapon, the Scream of the Three. Missing a plane has always been my worst fear, but after reading this experience, I think my new fear is flying with children. I haven’t taken Dawson on plane yet….not sure how he would handle it! I hope you have a better trip home when time comes to go again. In the meantime, have a glass of wine and relax. IF that’s possible I mean. Okay, I really thought I was the queen of painful traveling with kids stories (We do the 20 hours in the air to Australia every year) but Sister, YOU WIN THE PRIZE! Did you really miss your plane and hit a bird all in the same day? My sympathies are with you. That trip sucked. Sorry you had to go through it, but at the very least, it made for an awesome blog post. It’s the littlest one that can throw the biggest wrenches in the proverbial cog sometimes. Meltdowns are NEVER fun to deal with. I feel for you that you had to go through that but am glad that you are back home, safe and sound. Wow! I didn’t realize that it was so difficult to get on a plane with little ones. It was a great story to read though. Oh and the Brooklyn in me comes out……..Some of those agents need a kick. Oh, I feel for you. It’ll make a great story someday, when she reaches the age where she carries her own backpack onto the plane and sits there with her books and puzzles through the entire flight. Just keep gritting your teeth — you’ll get there. Lordy, that episode was right out of the 3-year old playbook. After an episode like that, a glass of wine just isn’t enough. You might as well hit yourself in the head with the whole bottle. Ugh, that gave me chills reading about the whole airport fiasco. I’m never traveling with your children again, either. un – be – lieve – able ! Couldn’t get much worse than that. Ooh poor you! I think I would have joined in and cried too having found I’d missed the flight. I never know how those mothers do it! 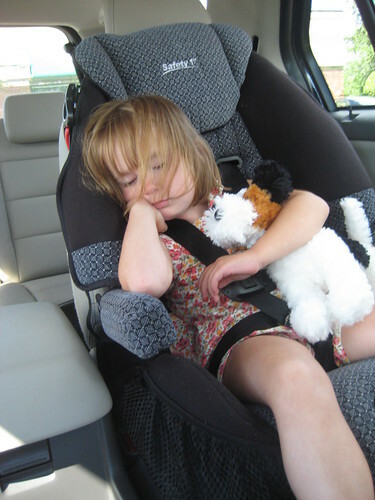 Manage a couple of kids in tow – kudos to you! followed 30 seconds after calming down by “Mom, you’re the best mom in the woild.” Yeah. Oh man. Just reading that makes me feel defeated.